I love October. Where I live, leaves turn color, the air is crisp, the rain begins, and I get a surge if craftiness at the same time Mr. Slippers gets the urge to build a fire every night and the bunnies demand hot cocoa as often as we will allow. Holiday crafting is ramped up around here. You can expect an Etsy update soon, and perhaps an appearance at a local craft show (if I can hop fast enough), ans because so many folks have admired them, a little early gift for you. 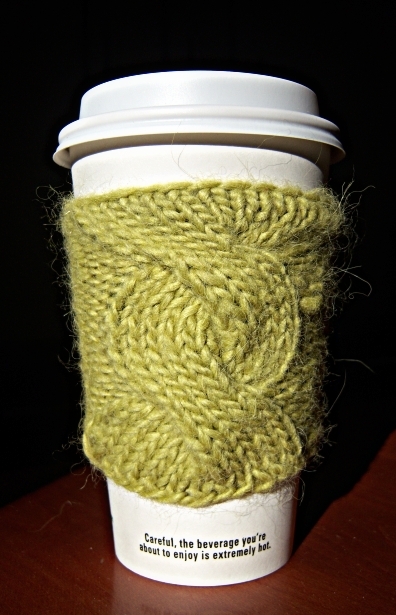 Here is my free cup cozy pattern, To Go. And because I am feeling generous (and in the midst of crafting things for sale). I want any knitters out there to know that I am quite happy to allow knitters to make these cozies for sale this holiday season. I only ask that you contact me and give the details of your plans. All right, back to crafting then. You are currently browsing the Bunny Slippers blog archives for October, 2008.